Yelp is one of the properties that online businesses need to manage. But be afraid. Yelp reviews are inaccurate at best and a disservice to the Internet because it presents itself as open, transparent and accurate. What magnifies this problem is that Google has not figured this out and ranks Yelp pretty high in Google search. I have been working with a client who is in the resort business with 14 properties nationwide. (I am keeping their name out of this so as not to suggest that this post is a cheap form of an advertisement). I have been advising the client in their digital and social media forays and helping them with their reputation management. This client has been in an industry whose reputation has suffered as a whole over the years. Often the complaints were legitimate. But those complaints were the squeaky wheel as we learned at this client. To figure out if the hit to their reputation was justified, we instituted the Net Promoter Score test, championed by Bain. On exit surveys with a statistically significant sample, the company is ranking with a +45 Net Promoter Score, indicative of a high level of customer satisfaction. While their score is not Apple’s (77) its as good as Adobe’s (46). Perhaps this inaccurate picture stems from the fact that the industry as a whole has consistently shunned engaging in social media while the small number of detractors have used it comparatively effectively. Again — squeaky wheel syndrome. Looking at their online reputation, we found that Yelp was ranking high on SERP and took a look at the service in detail. We quickly found numerous duplicates for the headquarters of the company and for the 14 locations. But Yelp provides no mechanism to take ownership of the listing and fix it as the brand owner. Problem: If you are trying to manage your reputation, its pretty hard to do so when you can’t control for duplicate or erroneous basic data like name, address, etc. Anyone can create a listing on Yelp regardless of the brand’s approval. This is in considerable contrast to Google Places or Facebook pages, where the business owner can be verified and the owner can modify/consolidate listings to ensure accuracy. When we reached out to Yelp regarding this data disconnect and lack of access to the client’s data, we received a call from the sales department. For a fee of $80/property/month, Yelp could fix our data, consolidate listings and put pretty photos and videos on our listings that we supply to them. Yelp Reviews are worse. Once we setup a business account and paid to clean up the duplicate listings, we then focused on the reviews in our Yelp system. We found that the client has 28 reviews on one of its properties. But the client only has 1 review show up on Yelp with a rating of 1 star when you search and find the Yelp master listing for the client!!!! Where is the logic to that? Below is the analysis of all the reviews and stars associated with the brand that have been entered, but not necessarily released by Yelp. Yelp Filters Reviews — So What? It is understood across the internet that not every review is accurate. They can be bought or they can be malicious. So, logically, there is a process whereby reviews are moderated for accuracy. If deemed “accurate”, then the review is published and counted toward the overall review score. Yelp ignores perfectly valid reviews unless the reviewer is a Yelper. Instead of leveraging the more painful moderation process, Yelp uses “algorithms” to determine if the review is valid. According to my Yelp business relationship manager and their FAQ, Yelp filters the validity of the review based on whether this reviewer has ever reviewed on Yelp before. If they have not, the review is filtered out. If they have, its filtered in against other additional criteria. What that means is that if Yelp does not know you, your review is worthless. Thus, if President Obama, who is not a yelper, wrote a review it would not be included in the review rank/score because he is not a Yelper and has not written reviews in the past. With my client, we currently have 27 reviews filtered and only 1 published. Of course, the 1 star is published while the 27 average a much higher score if they were included — 1 star rating vs 2.75 if all of the reviews were not filtered. 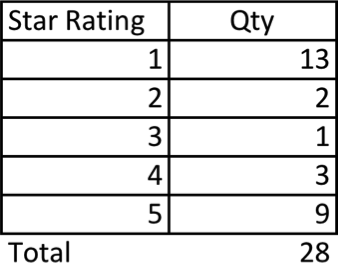 Unlike Amazon or Google, (I know, Amazon has its own issues), a new reviewer that is accepted by yelp can have mathematical influence over the overall score since there would only be 2 reviews being ranked. One of the key benefits of the Internet is supposed to be information transparency and exchange. Anyone can rise up and disintermediate existing players in any market. But Yelp is making every effort force their review system into a closed, hierarchical non-internet architecture that is supposed to make browsers feel that the reviews are accurate, when in fact they are easily manipulated by the tyranny of the few. Yelp does a disservice to the value of the Internet. Its a wolf in sheep’s clothing. It provides the appearance of all that is good about the Internet — transparency and authenticity, but instead has created a closed loop system that is anything but accurate or fair.